This is the full list of comments people made about how much help they had received with left handed handwriting from their teachers. I received no help what so ever regarding my writing, and has not known about "To position your hand under the writing line", until now, doing the survey, 24 years old. A little, in kindergarten all she told me to do was slant my paper. Again, nothing has ever been done to help me with my writing, even during my attendance at my infants school, my teachers tried to force me to write right handed. Fortunately it didn't work. Again, this is something that I do with all children but especially with left handers. All my teachers do is joke about my sloppy handwriting but I'm in a pretty lenient school. Amazingly enough, I taught myself how to write - and it looks like I'm writing right handed, but with my left hand. That seemed to really come easy to me. Other things, not so much. As and older student, I never saw an extra materials to help my with my writing. I often had to find go to other classrooms just to borrow scissors that I could use for art projects. As I said she was left handed so she showed me some tips! As I went to several schools, I had to spend more time and effort concentrating on the different "house styles" which were always taught one way! At least I was never'taught' to write right-handed instead. I just had to muddle through...was very messy because my first few years at school we used the old fountain pens...blue hand and blue pages all over the place. At the time I was in grade school, the teachers tried to force me to change, however, I remember my parents asking the teacher to let me write with my left hand. At the time I was in school (50 years ago) there was no acknowledgement that left-handed people even existed. We were never made to do things right-handed, but equally were never told why exercises like penmanship drills were so difficult. Back when I was in school I learned to adapt because there weren't any tools for left-handed students. In elementary the teachers tried to change me to right-handed but it never worked. BASICLY I WRITE DOWNWARDS HAVING THE PAPER TURNED 90 DEGREES. WORKED IT OUT FOR MYSELF THERE WAS NEVER ANY HELP. THEY JUST TRIED TO MAKE ME TURN MY PAPER THE RIGHT WAY UP. Both my parents are left handed and taught me, essentially, to write. At school I was given similar treatment to other kids, i.e. in being taught to hold my pen properly. My mum taught me to angle the paper. Never had problems forming letters. But my mum and I started a left handers club at my school so I now do understand a lot of stuff and tell others. By the time I was in school I already did most of this without thinking. I do know that when it was time to learn cursive our teacher was very clear about how to tilt the page if you were lefty vs. righty. I may have been the only lefty in the class but I was never singled out for it, just treated as a member of a select group. Can't remember if I was ever given help. Don't think teachers recognised problems of left-handers when writing. Early on some teachers tried to change me so that I would use the "correct" hand. Thankfully, my parents were having none of it (and they are both right handed). Everything was taught from the right-handed view in learning how to draw each letter of the alphabet. For sure they "showed" it, but I don't believe they emphasised it enough, for several of my left-handed classmates had a hard time at writing and/or write'hooked" or with other incorrect form. However, I also don't believe the teacher should cater to left-handers just because writing is different for them. It is also the responsibility of the child, and I think at the second grade age a child is mature enough to know if/when they need outside aid. Both righties and lefties should be shown equal demonstration of proper technique for their specific modes of writing. Lastly, just as a teacher would correct a right-hander who was doing improper technique or otherwise was in need of help, obviously so too would a teacher treat a left-handed student. In regards to the "letter formation sheets", aren't the letters supposed to be formed the same way regardless of handedness (at least for Denelian)? If not, then I was taught wrong (not saying that I followed all that I was taught). Although I do think that the emphasis on slanting to the right was too great. I see no reason why, as long as the print is all slanted in one uniform direction, slanting "back" or to the left shouldn't be acceptable. For the most part no for teachers giving specific help. They were more concerned with are you comprehending the material and not on the how. Handwriting classes were the bane of my primary school life - I was constantly sent back to my desk to re-write whole lines of text as it was difficult to read, but never given tips on how to improve it! Hannah even had a left-handed Teaching Assistant, but didn't seem to get any special guidance. She was the only left-handed student in the class. Hell No, the few lefties that were in school were pressed to conform to the right handed society. We were treated like we chose to be left handed just to screw up the teacher's day. i adapted to angling of paper and pen position and proper holding on my own throughout the years. I am currently training to be a teacher and am about to enter my final year. We have received no information, to date, during lectures on how to support the needs of left handed children in the classroom. I believe some schools now teach cursive writing appropriate for leftys, buy many still have to work it out for themselves. I believe they were disappointed that I was not right handed. I cannot remember if I was given any specific help at primary school apart from triangular grips for pencils, which are also given to righties to improve grip. I did have an art teacher once who told me the correct position for a left hander to write was the hook fashion, but this was never forced on anyone. I didn't even know there were specific techniques etc. for left-handers. I didn't know they made a letter formation sheet specifically for Leftys! I didn't think there is a specific way to angle my paper. I do not remember much. What I do know is what my mom told me. I know that one of my teachers tried to make me hold my pencil differently, but I did not like it and my mom said who cares as long as I can write. My kindergarten teacher was also left handed so she might have helped me when other right handed teachers might not have. I don't feel that I really needed these as I write without a hooked hand, although I often turn the paper a lot. I don't feel that my teachers were ever aware that I was left handed. I don't recall having any problems at school stemming from being a lefty. I guess I'm lucky in that I was always able to figure things out for myself. I don't remember if they helped me specifically with being left handed. I just know they always tried to correct how I held my pencil. I don't think that left-handedness was recognised as a real factor in my untidy work - just that it was part of being "Me" coming from a family of right handers, it was not seen as a condition to be helped, just that it was a fact of life. I especially had trouble learning to write in cursive. Learning cursive depends greatly on the formation of the letters. Because I was using my left hand to write, I could not follow the teacher's directions to form the letters. I am 22 and still cannot write properly in cursive. I even got told off for giving assignments in, turning upside down because of that nasty spring issue. I formed my own techniques. Actually, they tried to make me use left handed scissors when I was 5, but I actually use right handed scissors, therefore I couldn't use the ones they gave me, which was confusing! I got no help or support whatsoever - I don't think they even noticed that I was left handed. i got told off for having my paper at a funny angle. I had a nun in first grade and she was excellent! She taught me how to tilt my paper so I wouldn't have to contort my wrist in that funky left handed way. I had a teacher who in 1987 still tried to convert me into becoming right-handed in Grade 1. But parents couldn't even help me in holding my pen properly. I had to figure out by myself how to angle the paper and to write under the line. It didn't help I went to 5 schools in the first 4 years. I had to learn all of this on my own. In kindergarten I was forced to write right handed, but refused to and continued to write with my left hand. I have been punished for smearing pencil lead on the desk that accumulates on my ring and pinky fingers. I have developed my own mechanics of writing over the years and as a teacher have helped many "lefties" overcome the stigma of being messy writers. i have never been properly taught how to write better and I feel it is why my writing is so messy. My teachers do not care about my greatness. I have never been taught any specific ways to compensate my left handedness. Just trial & error for me. I have only just been informed by my 7 year old daughter's teacher that we left handers will find it easier if we angle the paper - how I wish I could have done that 30 years ago at school! I hit around the head to us favour my right hand over my left. I hold my paper the way right handed person would because they didn't show how left handed people should. I just naturally turned my paper toward the right instead of the left. This was easier and more comfortable than twisting my wrist around to write backhanded. I truly think that teachers never noticed I was left handed. I was in 8th grade the first time a teacher made a comment; she said-I never noticed you were left handed until I saw you drawing a line (from right to left). I know that my daughter is being taught to use a tripod grip which even as a right hander I find makes my fingers ache! She is also made to have her paper directly in front of her, despite me informing the teachers that tilting helps her, and that this is what I encourage her to do at home when writing. I learned how to write properly by myself. I was never taught to'hook' and I'm not really sure how I learned to angle my paper. I supposed I just figured it out. I learned to write as any right-hander would have. Practice, practice, practice! As for holding writing utensils, I did it my way (which is slightly different from others) - and my penmanship comes out just as nice and neat as anyone else's. I never got any specific help which only annoyed me when I got older. There were a couple of lefties in the class and the other guy now writes hook-handed. I never got anything but disapproval from my elementary teachers. In Jr. and Sr. High school no one seemed to care what hand the student was. I never really had any help, but on several occasions in grade school other classmates would inform me that I was slanting my paper the "wrong" way. I've never tried positioning my hand under the writing line I'm going to try that and see if it helps with anything. I never really picked up on the paper angling thing and I still mash my pen in what everyone thinks is a rather weird fashion - gets the job done though. I never really needed school help, and my handwriting was one of the neatest in the class, so my teacher never helped me specifically. but no position mats were there, but there was always at least 2 left handed scissors, although I cut with my right hand, so that wasn't a problem. I never received any help from teachers. They hated the fact I was left handed. They would criticize my handwriting constantly. And when I went up to secondary school, my primary school told them I couldn't read or write! I provide Occupational Therapy in a school district in the United States and am glad to report that the teachers in my elementary building are very aware of left handers and their difficulties and try to accommodate as much as possible. I realised all this myself and my teachers never interfered. I received no help with my writing, it was so frustrating! I learnt to use right handed scissors. The teachers didn't help me because they were all right handed and didn't have left handed knowledge. I remember the marks left on my hand by the Wire Binders. I said no to all of these because I didn't really know I knew I was left handed, but it didn't register to me that I had problems, I thought everyone else in my class was going through it too. I specifically remember having problems when first learning to write and being told to have a "finger-space" between words. For right-handers this is very straight forward but almost impossible for lefties!! I think that teachers should be more aware of these products, because if you don't learn when you are younger, you have problems with illegible handwriting later. I was at School in the 70's and 80's and just had to get on with it. I do angle my paper but not sure if this is correct, but it does make it awkward if you are sat next to someone. I was basically left to find my own way for writing and in those days you were ignored as they didn't come up against many left handers. I WAS FORTUNATE TO HAVE A LEFT-HANDED TEACHER AIDE. I was just left to work out the best way to do things for myself. With no one else left handed in my family there was no one to show me. I was left to get on with it. I was left to my own devices. I remember having several teachers whilst at junior school and this caused me to lose confidence in my writing. I was a slow learner & had trouble reading. I was made to write with my right for three months un till I broke my right hand and reverted back to my natural lefthandedness. I was never discouraged from writing with my left hand, and I mirrored right-handers in the way I held my pen etc. I was never given any help at all as a lefty, but never "corrected" to be a righty either. As a child of about 6 or 7 learning joined up writing I had help as my writing was messy but there wasn't anything about pen holding just even strokes and things like that. Generally I just worked out what to do, I would have loved some help though. I was never shown any help with learning how to write left-handed, as if without being right-handed they had no way to help me. I was left on my own. I was not taught how to hold a pen correctly until my senior year in high school. The teacher was new to our school and made me practice writing correctly to avoid hurting my wrist and smear my work. I was only given left-handed scissors by my kindergarten teacher that I still use today. The only thing my teachers allowed me to do was to find a left-handed desk where I sat by myself on an aisle so I wouldn't disturb any other students. I was shown at home how to write but was told not to do this when I was at school the middle years were the worst. I was shown how to angle my paper properly for a RIGHT-HANDED student. I was simply taught how to write exactly like everyone else and neither helped to be a better lefty or harassed for not being a righty. The result is I can write well enough, but it's ALWAYS smeared and my hand hurts if I write for a while. I was so lucky to have a teacher in the mid-50s who knew how to teach left-handers. I was taught in school to write with my right hand when I was 4 and 5 but quickly left that behind when I was 6. 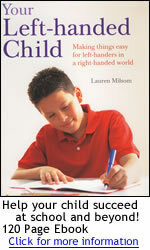 I was taught the same as right-handers with right-handed guides. I was told that because I was left handed, they couldn't teach me to you an ink pen & while everyone else in the class were given pens with nibs I was handed a biro. Too this day my handwriting is much better if I write with a pencil. I was treated no differently to right handed children. I was unaware of nearly all left-handed equipment and/or techniques until after graduating high school. I wish they had taught me the correct way to write. I especially struggled with cursive. I write exactly like a right handed person, except I'm a lefty. Now that I'm in college I've been forced to write in pen, and my papers get knocked down points for being smudged. I've talked to the teachers, and they just tell me to learn to write another way. I write in the "hook position" because I had so much trouble learning to write as a child. One of my teachers this year told me, "You're angling your paper the wrong way." When I asked why he said, "You're left-handed, but you are angling your paper the right-handed way." I was never taught in any particular way that helped me as a left-hander. I guess that the position angle my paper is the reason I tilt my head to the other side when I write. This is a very uncomfortable way to write, and I get tired quickly. I'm feeling a bit jaded. Was all this stuff even available in 1987-1992 when I was learning to write? Was I that left behind?? I'm really not sure how I learned to write the way I do, all I remember is that I basically had to figure it out on my own. Nobody in my family could help me either. I'm the only left hander in my family so my parents couldn't help or advise either, I just found ways that worked myself. In first grade my teacher chastised me for smudging my writing, but in second grade, my second grade teacher was showing me how to properly write and hold a pencil. In grade 2, the teacher taped my hand to the desk and forced me to write right handed. My father went to school the next day and stopped this practice. In grade one, the teacher tried to force me to write right-handed. I could hide and "cheat" at my desk, but writing on the blackboard, I couldn't. I still write with my left hand at all times, except at a blackboard. In Israel we write from right to left so for us lefties its easier, I guess. Think of all the right-handed Israelies who needs to write from right to left. In my math class we were given seat arrangements and I was put by a wall. I usually sit turned to the right direction and with this new seat I was now facing the wall. I asked the teacher to move me because I was left-handed and the teacher did move me. In saying no to all answers, I have tried to make an effort with my daughters teacher, see comment above. In school, my teacher tried to get me to become right handed. I wasn't allowed to use left handed scissors. I learned how to use right handed scissors and to this day feel uncomfortable using left handed scissors. In Spain, 40 years ago, it was unthinkable. Nowadays the children are permitted to write with their left hands but without any help from teachers. In the third grade I started out writing with my paper almost upside down with my wrist bent at 90 degrees, then my teacher got me a brace that held my hand and wrist straight. Now I write pretty much like a right hander, just smear ink with my hand some. In third grade when learning to write in cursive the teacher told me that my letters were slanting the wrong way and that I had to learn to slant them correctly. In year 3 I was helped because the teacher was left-handed. It is obvious from watching younger people in America that they are not receiving training in how to hold any writing instrument, much less placement of writing media. Seeing the various contortions being used makes me wince. I've never had any help from teachers. Poor me!!! I wrote with both hands and was encouraged to just use my right, so I chose to just use my left! Just got into trouble with teachers who thought I was being left handed just to bother them. learnt how to angle paper and hold pen myself. always had problems with desk space at school would always end up on persons desk next to me. Left-handers got pencil grips in preparatory school. Luckily I seemed to teach myself to write well without it being particularly slow or with a hook. This however, wasn't due to anything that my teachers taught me and I don't remember my parents mentioning it either. luckily my mum is a teacher so she knew what help I needed so she helped me at home. Moving from primary to junior scholl gave me a temporary respite as in order to complete the set work in the time allowed, I had to write left-handed. The school then swapped from cursive to Italic handwriting and the pens were all right-handed so it started all over again. Mum is completing this with me and she asked at school when I started there and they had no special help or advice to offer either for me or my left handed classmates. My 1st grade teacher would give a lollipop to each student who made a grade of 100 on their weekly spelling test. I have always been an excellent speller but this teacher gave me a hard time about writing my test with my left hand. She actually did not give me the lollipop one time even though I made a grade of 100! This happened in 1981 but I remember it like it was yesterday! My biology teacher in high school told the left-handed people in the class to try writing so that their hand was positioned below the writing line. I did try this, and after awhile, my handwriting improved, and I wasn't smudging anything I wrote anymore. I still have to think about it sometimes because I have a tendency to go back to my old habits. For the most part, I write much better. My experience us that they treated me as a right handed person. It is only since my parents complained that school have sought to rectify this. My experiences were a little while ago though. But as a trainee primary teacher myself, we have been given no information yet on helping left handed children. My father had to tell the teacher not to change me from left to right handed. My father taught me how to write, how to hold my pen, tilt the paper, he even gave me special pens to use that had rubber grips to use so the pen would tilt automatically for neater hand writing. The teacher refused to allow me to use these pens and would tape my paper square to the desk so I could not use it.. When I started to write backwards (no smudging and it felt natural!) she would tear my work up and make me stay in at playtime / PE / not allow me to do the fun activities... till I'd written everything out again. paper, pen, reflected my needs. Only much later in my life did I recognize how lucky I was and how important those lessons were to training my own two of three sons that are lefthanded. my first year of school all of the writing books I had had left handed written at the top and I always had to practice certain letters. My kindergarten teacher was wonderful. She took a great deal of time showing me the correct format for writing. She also made sure there were basic supplies like left-handed scissors. This was very important because it set the foundation for my penmanship today. My left-handedness was barely tolerated my my teachers. My mother actually did those things. My handwriting was all but illegible, and very backhand. She had learned by the Palmer method, and she taught me those exercises, which can, of course be done left-handed as well as right-handed. My mother did all of these things. My mother who is right handed showed me the easiest way for me to write more comfortably, also purchased a supply of pens to be left with the teacher when in primary school. My mum gave me a yoropencil and a stabilo non-smudge pen and it is all better now. My mum tries to get me to hold the pen correctly as she is left handed as well. My son (now 11, then 6), who is also left-handed has been told to write with his hand above the line and wrist bent at a right angle. His teacher did not see anything wrong with this until I invited him to try! The teachers in his school were completely unaware of the needs of left-handers when writing or that there was help available. My teacher bought me special triangular pencil grips so I would hold my pencil correctly, and I still do not. My teacher did not help at all they actually criticised me for being left-handed.... One teacher (forced to retire) actually allowed the other students to call me stupid and other names... She then told me that if I would have learned to write with the "Right" hand and not the "Wrong" one then I would not get picked on. My teacher failed me in handwriting class because of the way I turned my paper. Private school. My teacher treated me like I was defiant because I would not obey and use my right hand. She treated me like a problem child. She would make me keep my paper slanted the way right handed people do to conform to the rest of the class. When I tried to explain it didn't work with being left handed she told me to use my right hand and it would work. my teacher used to moan because I smudged the writing that it looked like a drunken spider had jumped in an ink well and walked over my page, but never tried to help me sort this out. My teacher wanted me to write right handed. She taped my paper to the desk and made me write with my right hand. I began to stutter and my father was on me all the time to stop. I was grounded and humilitated by my father. I finally told him what the teacher was doing with my paper to get me to write right-handed. my teachers (especially at primary school) treated me as an alien because I was left handed and the only one in my class I was called the daughter of the devil by one teacher and made to sit on my own in the corner I was also ignored much of the time. it wasn't till further on in my education that a friendly teacher helped me. My teacher's gave me such a hard time that my mother went to the school and told them to allow me to write with my left hand. Nobody at school helped me. They all thought that I was strange. These feelings have stayed with me all my life; resentment and anger. My teachers never gave any specific help to left-handers. I was lucky, however, to have two left-handed parents who taught me how to write. My teachers wouldn't even notice I was left-handed and they showed us how to do everything with their right hand and if I asked for help they didn't know how to position the pencil or anything. They would just let me do my own thing, but I'm smart so it was never a problem. My Y2,3 & 4 teacher was left handed so she sympathised/ empathised with me, but I found I could hold my pen easily because it didn't smudge. Never did any of my teachers thins year allow me to have any of these surveys questions. Never remember even one teacher ever acknowledge anyone who was left handed. No for I seem to pick it up on my own. No help at all from any teacher, from school through to uni. Even the one left handed teacher I had at uni offered no help. Maybe she was happy to see that there weren't any real problems with her four left handed pupils out of 22. No help from teachers on this section... which is too bad. No help whatsoever has been given in school to either Edward or his older sister when it comes to handwriting. I have taken in the writing guide card that you sell, books about how to help left-handers, letter formation sheets and comments from surveys on left-handedness. Everyone is very sympathetic but they forget to show any of the left-handers how to do things. They do have the proper scissors in school but only 1 or 2 pairs per class, our daughter takes in her own whereas Edward battles with'wrong' scissors or tries to use his right hand. Both my children have been given left-handed scissors by us for use at home. I am trying to encourage good writing habits for my children but find it very difficult when the school insist that they position their paper in the same way as right-handers. Both children have poor letter formation and write either very large or very small and usually on a downward sloping line (even when they have lined paper). Our daughter has developed a poor grip and bends her wrist awkwardly and finds her hand aches after a short while. She has also developed a callous on her finger from gripping the pen too hard. As she is in the first year at Secondary school my fear is that her aches and pains will increase as she has to write more and more quickly. Also with her being at secondary school as parents we have less direct influence over where she sits, in most classes it is in alphabetical order and the other girls in the register around her aren't left-handed. I am battling hard with both my children to get them to use the techniques suggested by the club and this summer I am making a concerted effort to correct some of their bad habits, but this is hard when the message they get from school is so different. No mention was ever made of left-handedness or that there was any difference. No, I had to muddle it through myself, and I don't think I learned the best possible - I write on a straight paper with an angled hand, which can cause wrist aches. No, the damn teachers make me hold my pen and position my paper the same as right handers. All they ever did was criticize my handwriting. I see that things haven't changed in all these years. None of my teachers ever did these for me because I am an able student and very intelligent so I figured out the angle etc on my own. None of this was available when I was at school! nope, left handers were scarce.. so they would just let you do your own thing. Never gave any advice on what to do, if you didn't tell them that you felt akward..they never would ask ahead of time. Not given any'help' but there again did I really need it? One of my left handed children was doing penmanship and the teacher told him to position the paper in a way that was awkward for him. I told him to position the paper the way he felt was comfortable. The teacher told him to tell me that she had been a teacher longer than I had. The message went back that I had been left handed longer than she had. The result was that she backed off from the issue. One of teachers labeled me lazy at six. I needed to lie down on my right arm in order to block the sun out of my eyes. Everyone else faced away from the sun. My teacher used to ask if I was tired! I used to wave my left hand at her, but didn't have the vocabulary to express what I meant! Only 2 have ever helped.The majority have not even noticed that I am left handed. Only my first-grade teacher, who also was left-handed, gave me advice. Actually, when she showed my how to hold my pencil, she was showing me how she always did it -- and this was back in the late-50s. No other teacher attempted to help me out. Only one teacher who was wonderful, when I was about eleven. She gave me some advice because her friend had problems writing as he was left-handed. Parents (filling out survey) purchased from Left-Handers. Sent to school -- never used. They seem to think it's the same as writing right-handed. Positioning the paper the way the teacher showed me only slowed down the writing process more and made my handwriting worse. So I don't use that position, but whatever is most comfortable for me. Really, only Mrs. Del Pizzo (my first grade teacher) helped me at all. I was lucky that my father was a lefty, too, and so he helped a lot before and after that, but she taught me the correct way to hold my hand, and I am very thankful to have had her guidance. She was right-handed, but she knew so much about my problems that I never wondered about letter sheets or anything, because she was too understanding. If my work was messy, she'd have me re-do it, without it being counted as late, and if my letters were reversed, she'd have me write those out properly until I knew what to do. She tried and gave up. But didn't mark me down for not doing it the right-handed way. She also told my mom that. I don't think the mats existed back then. She did try to mimic left handed letters on the board. No one got individual sheets. Showed me how a right-hander should hold their pen. Some teachers gave me help, some didn't. I more or less found the angles I was most comfortable with, because I didn't arch my hand all the way over, just partially. Some teachers understand and try to help others don't take an interest and don't care. My mam bought me a mat from you and sent it into school. Some-one must have taught me how to hold my pen & to position my hand under the writing line, but I can't remember it. Maybe this is an indication that my learning to write was trauma-free. Spirals also need to be made for left-handed people. teachers did nothing to support me, but I am now a primary school teacher and promote and encourage my left handed children and support them with their developing of writing. Teachers give me bad penmanship grades and tell me that if I will slow down, I will do better. But then they don't give me time to slow down. Teachers never tried to help, just told me to "do the best you can"
Teachers used to say that left- handers were abnormal , and that we "couldn?t do things properly with "that" hand". Teachers were extremely unhelpful. In primary school, teachers became very angry when I asked for different scissors. I couldn't use those cheap metal ones. Teachers would try to use their right hand to guide my left hand, resulting in quite a mess and confusion. Ten years later, I just found out from my second-grade teacher the way you're supposed to angle the paper. You have to position your hand under the writing line?! Thank God that my dad is a lefty so I could learn most of that at home. The biggest comment that was made about me in school was that my writing was too neat to be done by a left handed person. The only "help I received was being told how to hook my hand so the pen was positioned like that of a right-hander. The only "help" I remember being given was to be told by my teacher that left handed people are weak-minded and will never achieve anything in life. THe only special treatment I got in school for being left handed was the fact I needed to sit at the end of desks. BUt not only for my convince, other complained that I bumped there right elbows. The school seem very well prepared for left-handed students and are always available for extra help when required. The teachers at the setting are now much more aware of the differing needs of left-handers and the handwriting policy has now been rewritten to include guidance for left-handers. The teachers gave up trying to teach me how to hold a pen - I have my own unique style that is commented on even now! The tilting paper changed my life! Writing position mats / Letter formation sheets - never existed in my day! These things were done at home so that I was prepared for school and had no problems. It is time that parents took more responsibility for their children and not leave it to the school. If "bad habits" are learned before they come to school it is almost impossible to rectify them at school.Also I won a national writing competition when at school- for writing with an ink pen too.No smudges!! They didn't seem to grasp the idea of teaching me better ways of forming words its as if they were stuck with showing "normal" pupils how to wright and couldn't see outside the box. I was told to hold my pen like all the others. THEY DIDNT TEACH ME . ITAUGHT MYSELF. They don't even care about that, even when you tell them that you have some problems with it. They followed all the rules for right handers and expect the left handers to do it the same. They just patted me on the head and said I was a good girl. They only tried to force me to print right handed. They sent the few leftys to a class to learn to print right handed. It messed me up so bad that I began to stutter in my speech. Then they sent me to a speech class! My Mom caught on and said enough. I went back to printing left handed and the speech problems went away. Philadelphia, Pennsylvania Public School District circa mid-1950's. they tried, but this was not the method that worked for me. As a teacher, I encourage my left handed students to write in a way that is legible AND comfortable for them, no matter what that is. This information was imparted to the entire class, not use left-handers specifically. If anything, the teacher in whose class we learnt to write with pens (rather than pencils) was very critical of my left-handed-ness and treated me like I was stupid. This is one area teachers need to improve. I am in the unfortunate habit of holding my pen incorrectly which leads to cramps in my hand and my writing not being as neat as it could be if my pen was help correctly. though by moving the classroom round for the few left handers and giving us cushions to put under our arms it made use feel like the odd ones out. To be fair, I never found being left-handed being that much of a problem growing up. I just saw it as one of those things and got treated equally for it. Tried to make me write with my right hand or write MORE right handed. Until I found this site I didn't know there was a correct way to hold a pen or pencil. I had trouble making some letters when I was little but I don't know if it was because of my disability or my lefthandedness. Until the 7th grade, when I finally got a male left handed teacher, teachers tried to make me write with my right hand. Well.. my grade 4 teacher taught everyone to tilt their paper to the left while writing cursive. I was the only left-hander, so she told me to tilt mine to the right. She didn't show me, so my writing was all over the page. It took me two years to perfect my cursive. went to a convent school, so you can imagine what the nuns thought of me, yes the devils own, so no help was given, if anything the ruler was used across my knuckles to discourage me from using the left hand. When I started kindergarten in California in 1972, I had already intuitively taught myself to angle my paper correctly to write left handed. My teachers tried to force me to write with my right hand, but my mother insisted that I be allowed to write left handed. After that, they stopped trying to make me change, but offered no instruction in "proper" technique. When I was in elementary school, I actually had a teacher that suggested to my mother that my left arm be broken in order to teach me to be right handed, thank God my mother didn't go for that!! As a matter of fact, I can remember being in Middle school and one thing they graded on was handwriting. I was a AB student but I never could be due to as much as I tried I always got a C in handwriting. I can still remember being so upset. When I was in kindergarten, my teacher had tried to get me to switch hands. I flatly refused. Fortunately, my parents were of the mind that I would be better off if I were to use whichever hand came naturally. When I was learning to write, my teacher tried to switch me to the right hand. My parents noticed and told her to leave me alone, that I was left handed. She said "If she doesn't change hands she'll be the spawn of satan!" My parents said that me being satan's spawn was fine with them. My teacher's conscience wouldn't let her continue to teach me so she just sat me in a corner and let me play. (I never told my parents that part!) So I never did receive a good writing foundation. When I was younger my teacher didn't really help with that. Writing was such as challenge...especially writing in cursive. When I was younger they made me keep the paper like the right handed kids. YES - my 4th grade teacher was a jerk with this - always turning my paper around, etc. VERY hard to write with the paper completely straight - I use to write completely upside down but am now only at a 15-90% angle. You wrote one way, with the paper straight on the desk, period! I developed the hunch and hook while writing to keep from getting F's in handwriting!